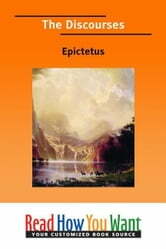 The Discourses by Epictetus is a record of different conversations that transpired between him and his pupil. These are aimed at explaining the authors philosophy about how to live a serene life. Discussing a wide range of topics from steadfastness to weaknesses from fear to poverty and from happiness to the lack of it this is a thought-provoking work. Captivating!